Welcome!~ Fanfictions' are stories, completely your own. Involving existing things that you are already a fan of. No matter if it's a book, movie, or person, you can manipulate it into whatever you want. 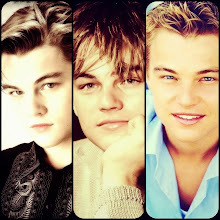 This is a blog created specifically for Leonardo DiCaprio lovers... where everyone is invited to live in a fantasy world with this attractive young man. I will obviously be writing, short and sweet, fan-fiction on here. But, remember... It's fiction, anything can happen! Also, there are some other little things here for you to check out. So, take off that jacket and stay a while! **Note: While writting fan-fiction is fun, I have full ownership of the stories and their plot lines...Unfortunately, I do NOT own Leo. "Ugh!" I screamed as I slammed the front door shut, and took off for nowhere. I just had to get away. Sometimes he just makes me so mad. I had to go somewhere quiet. I had to calm down and pull myself together. Why does he have to be so arrogant sometimes? Why can't he just admit to the fact that he's wrong and I'm right? Why does he think that he always has to be right? Why do we have to continue to argue and fight about it? I tugged and pulled at my hair, forcing it to fall from its' once beautiful French braid. I didn't feel pretty anymore. I wanted to fall apart and disappear. In the woods, I found a small place to sit alone and cry. I hate when this happens. It always hurts more when you argue with someone you love. I pulled my knees up to my chest and wept heavy sobs. I can't handle it anymore... the yelling and arguing. I held on to my depressing thoughts, as if somehow my anger would dull the pain, telling myself over and over, I am right, he is wrong, why can’t he see that? Why can’t he see that? I don’t know how long I was sitting there in my misery before I heard his footsteps approaching. "Hey sweetie," Leo whispered, "I thought I'd find you here." "Great, you found me." I choked down my next sob and buried my head in my knees, "Now can you please... just leave me alone." I don’t know why, but after a long fight and tremendous pain, we resent being comforted, his gracious whisper only made my anger grow. I wasn’t mad at him anymore, and I wanted to be, so I was mad at myself for not being mad at him, and mad at him for treating me once again with love and kindness. I heard him crawl down on his knees and quietly sit next to me. In the silence between us, I sniffled and he took a deep breath. "Actually," He spoke calmly, "I didn't come here to fight." I tried to ignore him, my heart still feeling cold. I know, I thought, that’s what makes me mad! "...I'm sorry," he confessed honestly. Why do you have to be so nice? I’m ugly my hair’s messed up, my eyes are red, I was mean, and I’m mad. Being careful not to startle me as if I was a nervous horse, he reached out. One hand on mine and the other brushing away my frazzled hair from my face, he said. "I don't like to see you upset." Yeah, well I don’t like you to see me upset either, so why don’t you just go away? It was obvious he wasn’t just going to go away. Knowing this, I looked up, I wasn’t quite ready to forgive him, but I knew we had to start somewhere; after all, you can’t stay mad forever. What I saw shocked me, he had been crying too! I was also struck by how unfair it was, he was still beautiful. "Hello," He smiled, eyes glistening, rims still red, "I don't believe we've met. What's your name?" Streaked in tears with red puffy eyes, my face cracked into a grin, weakly I replied “You, you know what my name is you jerk.” Again I smiled, it was good to be communicating, and he was really trying to make amends. "Oh yeah," he looked away as if remembering, he knew I didn’t mean it, "it was something like, Polly Wants a Cracker, or was it Curious Gorge the Monkey... so does that make me the Man in the Yellow Hat?" “Shut up.” I laughed and punched him in the shoulder, then wiping away my wet cheeks I was again aware of my far inferior appearance, I was a mess. Oh, but he loved me anyway, that was plain. "Nah," He poked me in response to my punch, "I'm just kidding with you." "Obviously," I poked him back. "So, do you forgive me?" Our argument felt so far away now, I don't even remember how it started or what it was about, "Yeah, I guess." He took a deep breath as if a cloud of heavy tension had left him, then I asked, "Can you forgive me?" He smiled warmly, "Of course I do." His fingers began gently brushing through my tangled hair. I closed my eyes, and in our new found silence of peace, I didn't try to stop him. As he worked out the knots, it was almost as if he could've been untangling my heart. A heart that had been broken to pieces only moments ago. I felt him attempt to divide my hair into three sections, and I smiled realizing he was trying to mend the French braid I had ruined. Like mending the wounds that had hurt my heart. He's trying to show how much he cares... how much he loves me. Taking the divided sections, he crossed them over, adding more and crossing over. We sat for a while, in silence, his fingers in my hair attempting to pull it back up to its former glory. Though I'm not sure how capable he was of re-creating a french braid, the fact he was trying was more than enough. "There." He said, "All better?" I reached back to touch it and was surprised to find the braid felt right. I turned to smile at him, "Yes, it's perfect. I feel much better. Thank you." "You're welcome," He hesitated, "Oh, wait! Don't go anywhere." I watched him as he got up and ventured over to a small grove of wild flowers. Leo took a close look at each of them before he picked any, and soon he came back holding a variety of flowers as if they were a prized possession. "Ok, turn around," He spun his finger at me, a signal to turn away. He knelt down behind me, and carefully weaved the radiant flowers into the braid he fixed for me. Is this the same man I had argued with? A moment ago I wanted to shrivel up and die, but now I felt beautiful. An apology was nice, but this felt even better. He had made me feel beautiful again. "There," He sighed, putting the last flower in place, "Now, it's done, and you look like the queen of the forest." Facing him again I blushed, "Really? You think so?" I couldn't possibly smile any brighter, "Thank you." He pulled me into a hug and whispered in my ear, "I love you,"
"I love you too," I whispered back. "Well," He exclaimed, pulling out of our embrace, "Now that's all cleared up, I'd love to stay and chat, but it looks like rain. Do you feel like you could come back to the house with me? I'll make it up to you... we can pick out a movie, snuggle on the couch and eat popcorn." He gave me his most brilliant smile, he knew I could never resist snuggling for a movie, especially where there was popcorn involved. "Okay, as long as I get to pick the movie." "Deal," He shook my hand, "But wait!" He started frantically searching for something, "I'm missing my yellow hat!" "Would you pick one already!" "Ohhhh, I don't know.... they all look so good." Leo stood anxiously next to me, "I could get you a double scoop and then you could pick out two flavors. How does that sound?" "Well," I attempted to narrow down my choices, "Ohh, I still don't know." He pointed to the other side of the cold glass, "Look, I see Chocolate, Mint, Sherbet... they even have a berry mix." He smiled hopefully back at me, "You like berry flavors right?" I gave it a hesitant thought, "Yeeaahhh...."
"Fine. If you don't pick something I will do it for you." "No-no, no, I can pick one." I stared into the long counter holding a delicious display of ice cream. "Uhhh..."
"Okay, Sherbet it is." Leo declared. "What??? No! I did not say I wanted Sherbet!" "Yes you did. I heard you." "But I don't want Sherbet... I want Chocolate!" "There you go!" Pinching me playfully, he smiled happily with himself, "See, I'm an expert at tricking decisions out of you." "You're so mean!" Still, I couldn't help myself from smiling. "What? No," He folded his arms in defense, "That's not called being mean. It's called, 'We need to get going, so I'm helping you make a decision,' kind of thing, " He paused, "It worked didn't it?!?" "Fine," I breathed out a sigh, "You win, I guess I want Chocolate then." I glanced back at the ice cream flavors, "Well..."
"O-k-a-y!" He steered me away from the glass counter nearly chuckling, "Let's just stick with Chocolate shall we. Or else we're gonna be here for another half hour!" "Na'uh!" I objected, "We haven't been here for half an hour!" "Fine, 15 minutes, whatever. Close enough." He handed me his car keys, "Can you start the car and wait for me?" "Okay." I took the keys and teased him, "I'll try not to leave without you." Leo laughed at the idea, "We've been married for a while now, I know you better than that... especially since I haven't gotten the ice cream yet." He winked at me, and I flashed back a wink of my own. We were ridiculous, and a giggled escaped me realizing that I loved it. With Leo, you're never too old to be your crazy self. "Here you go." Leo handed me an icecream cone as he slid into the drivers' seat. "Thanks." I gave the cold substance a test lick as he shut his door. Yes, I did want Chocolate. Feeding my tongue, I consumed more of the delicious flavor, and asked, "Um, so where's yours?" He looked over at me and smiled, "You're holding it." "Oh, sorry." I stopped, feeling guilty for diving in so fast, "Then where's mine?" I sputtered out a surprised laugh, "What? You mean you want us to share just one?" "I don't know," I tried to think up an excuse, "isn't that gonna get a little messy?" Leo looked at me as if he had been rehearsing something a million times over in his imagination. It reminded me of just how much affection I had for him. Maybe it was something in his eyes, or the delight in his smile...? Whatever it was, I was caught in a beautiful moment of some sorts and I wasn't about to question it. Lowering his voice to a pleasant tone, he leaned in to touch me, "Actually, I was hoping the ice-cream wasn't all that was going to get messy," Ignoring the small divider between our front seats, he pulled me closer, and surprised my lips with a kiss. Every possible thought flew out the car window like fireworks, all I wanted was more of his sweet chocolate flavored kisses. "Here you go," Leo handed me a cup of hot chocolate, "I hope you don't mind marshmallows." "Oh, thank you!" Wrapping my fingers around the warm mug, I smiled at him. It was freezing today, and the falling snow stacking up on the roads made it impossible to drive anywhere. He smiled back, "No problem," I noticed he had a cup of his own as sat on the floor beside me. "Thanks for starting the fire too." I gestured to the orange and red flames in the fireplace. He laughed slightly embarrassed, "No problem, it's just one of those days, so I figured why not!?" "Yep." I sipped my hot chocolate and sighed, "It's definitely one of those days." "What? Are you saying you don't like these kinds of days?" "Yes, and no." I struggled to decide, "Because, I love the sun, and being able to run around bare foot. Eating ice cream and swimming! But..." Glancing out the window, I saw the storm was getting worse, "Sometimes, it can be sort of fun to just sit by the fire and drink hot cocoa with you." "Hmmm, well," He fished out a marshmallow and popped it into his mouth , "I'll do my best." "Your best?" I asked puzzled, "Best to do what?" "To make this fun!" He took a big swig of hot chocolate, but without meaning to, it left a mustache on his face. I had to giggle at how silly it looked, "Oh Leo, you don't even have to try." "Hold on..." Leo whispered, "You're almost there." "How much farther?" I waved one hand out in front of me, while the other held tightly to Leo's grasp. "Almost, just a little farther." Though I was blindfolded, I could hear the smile in his voice. "I'll tell you when you can look." He continued to strategically steer me through a maze of trees in the outside woods. "Okay, and...?" I pressed the matter of his secret, "What is it?" "Would you be patient! You'll see in a minute." Turning: right, left, left, right, left again. It felt like we were just walking in circles, and without my sight, it felt almost sickening. But I knew deep down I could trust him, even though after a few months of being married, he still disregarded the fact that I HATED surprises. "Alright..." He stopped and tugged at the knot of my blindfold, "You can look now!" I felt the warmth of the afternoon sunlight beam down on my face as the blindfold fell away from my now open eyes. My excitement building up since forever finally released, and I shrieked, "Oh my!" "So, do you like it?" I stared in disbelief, "Do I like it?" I pointed, not sure what to make of it, "It's a tree house! A real tree house! ...in a tree!" "I know," stepping behind me, he wrapped his arms around my chest in an affectionate hug, "It's not the most romantic thing ever. But, I built it myself when you told me you always wanted a tree house, and never got one growing up." He kissed my cheek, "So, there you go!" "Awww, thank you! But... I'm not a kid anymore Leo, don't you think I'm a little too old for tree houses?" He squeezed me tighter, "Nah!" I shattered into surprised screams, feeling his fingers seek for my ticklish spots, "Ahhh! Oh gosh NO! ...Please, stop it!" I was forced into laughter as I struggled to escape his hold. Catching the contagious sound, he laughed with me, "You may be all grown up, but I know there's a playful part of you in there somewhere!" Letting me go, Leo bent down on his knees, meeting me in the cold, leaf covered, ground, "Did I get it out yet?" Gasping to catch my breath, I yelled at him, "What the heck?!?" "I don't think I've succeeded." He furrowed his eyebrows, "Hmmm... Must I act on more drastic measures?" He lifted his finger, and I jumped in reflex, "Oh, no!" I giggled, and sat up attempting to shuffle backwards for a safer distance. "Okay then," He smiled, and in that moment, not even the sunlight draping over us could compare to the feeling of warmth I felt from him, "Just for a few hours, let's forget all about the problems of this world... the nosy paparazzi, the gossiping news reporters, and my stressed out agents ...let's live like we're eight years old again. Who cares if you're 'older' and I'm famous? It'll be fun!" "I never said I wouldn't play along! You didn't even gave me the chance to decide! ...It wasn't fair play." "Oops sorry," He flashed me a wink as he offered his hands to help me up... but I hesitated, questioning the motives behind those fingers and that deceiving grin. "Don't worry," He chuckled with amusement, "I'm not gonna touch you." A thoughtful expression passed over him for a moment, "Uhhh... maybe." "Maybe?" I took his hands and let him help me back up to my feet, "What's that supposed to mean?" I brushed a few leaves off my sweater and raked even more out of my tangled hair. "It means, that it depends on how you behave." His thoughtfulness morphed into a mocking smirk. "Oh please," I smirked back at him and though he was much heavier than me, I challenged myself to give him the hardest shove I could muster up. "There she is!" His face lit up as he nearly tripped, "That's the girl I was looking for!" "Really???" I smiled, thrilled that I had pleased him, "In that case... Race you to the top!" I took off for the tree house ladder. "Hey! That's not fair play!" He lunged after me. "Oops sorry," I teased him, "Welcome to my world!" "Oh, you're so gonna get it!" He called up after me. I squealed as I climbed up into the dead end of the tree house, up here, there was no place to escape his revengeful tortures. "So, can I ask you again?" Leo laid beside me, allowing a moment of truce for me to catch my breath. Tangled in his arms on the tree house floor, I closed my eyes feeling exhausted with defeat, but at the same time, content. Still, he continued to pester me with interrogations, "Do you like it? ...This tree house, I mean? After all, I built it for you." "Yes," I murmured slightly annoyed, "It's very nice." "Are you okay?" He laughed at me, "You're not even looking at it." Although I was tired, one more weak laugh managed to escape, "Am I okay?" I opened my eyes and shot him the 'look', "What do you think!?! I'm practically dying here... remind me again why I married you?" Though, of course I was exaggerating, I aimed to make him feel guilty. "Gee, I'm sorry," He looked almost sympathetic, "But I was just trying to teach you a lesson." "Oh brother!" I didn't have the strength to retaliate, so I ignored his comment and turned my attention to observe the inside appearance of the tree house. The dark wood panels and the symmetrically framed windows, it actually wasn't too bad. I decided that I liked how the outer walls were built around the wild branches growing from the trunk, it gave a sense of vintage beauty. Almost as if this little structure had been built here for years, until new branches finally sprouted, and broke desperately through the walls, searching for sunlight on the other side. Leo nudged me, "Hello? You still in there? Or did you drift off to dream-land?" "Yeessss," Still trying to calm down my deep breaths of air, I replied, "I'm still here." "And?" He raised his eyebrows as if expecting something from me. "You still haven't answered my question." "Oh sorry... Thank you for building this for me, you did a good job. It's just what I would've wanted." I smiled, breathing in the fresh forest air, soothed by the sound of leaves rustling in the wind, "I feel like we should just spend the night in here." I sighed, relaxed, but still aching. "Yeah," He took in a deep breath himself and whispered, "That sounds nice." He paused, as if a troubling thought occurred to him, "But please don't tell anyone. It's our little secret, okay?" "Yeah, okay." I smiled to myself as a ridiculous image came to mind, "What?! You don't want the paparazzi showing up on the doorstep of our little tree house in the morning?" "Ha, ha, very funny." He sat up to look at me straight on, "The only thing I want showing up on this doorstep is you... got that?" I wrapped my arms around his neck, pulling him closer, "Yes sir... there's just one problem." I whispered, "You brought me here blindfolded Mr." I suppressed a giggle, "Right now, I have no idea where we are, or how to get back to where we started from... So, I wouldn't consider that fair play either." "Oops, sorry," He glowed with a playful smile that lit up his blue eyes, "Welcome to my world." Click Here for More About Leo!